I attended an impromptu turkey dinner (I know, it was as fabulous as it sounds) at a friend's place last night and brought this little number. If I can get my hands on a candy thermometer and a glass measuring cup, I'm going to be all over this. So usually I wait until after the jello has been unmolded and consumed before writing about it but tonight I thought I'd bring you along in real-time for a suspense-filled evening wondering: will it set?? Doesn't this one look pretty? Too bad it didn't taste as good as it looks. I have been loving this space for sharing jello stuff and also just rambling a bit, though. Hope you've been enjoying it too. This week was an experiment in foreign jello-molding and it had some hits and some misses. Finally! Jello. I was itching to try out the new tiny, round molds I bought back in Sonora over the 4th of July weekend and did a little late-night jello-molding (as you do) with a leftover half-box of Raspberry Jell-O. Summer is just getting underway in many parts of the US which means there's still plenty of time to perfect some boozy gelatin cocktails. Monday is America's Independence Day and also, I hope you will agree, the perfect holiday to make jello for. ...the obvious answer is to make Jello Pretzel Salad. My summer in California continues to be a sun-soaked dream and this weekend we went exploring up north to a friend's BBQ and along the coast for some beach time. The friend is actually someone I went to elementary school with but haven't seen since then. Paige, however, has stayed in better touch with him and so we decided to stop by his Saturday afternoon backyard BBQ to say hello. And obviously jello is a great icebreaker. It was a hit. We only decided to go the night before, so around 8pm on Friday I turned to Pinterest for inspiration (come find me on Pinterest, by the way!) and came across this recipe. Which, let me tell you, was a REVELATION. Jello layers are tough and require time and patience (both of which I am usually lacking). But this version gets you two perfect layers while you sleep. I kid you not. Dissolve the Orange Jell-O and Knox gelatin in 1 1/2 cups of boiling water and then add the 1/2 cup of cold water. Whisk in 2 cups of Cool Whip until it melts and dissolves. Pour the mixture into your pan (8" square is recommended) and let it chill overnight. That's it. The layers separate on their own while you sleep. Obviously this is an opportunity for a food chemistry lesson but I prefer to just explain it as voodoo gelatin magic. I made the original recipe as described and found it quite difficult to unmold (also due to the glass dish I used which makes it hard to evenly heat and release). So I recommend the modified version above and to use a metal pan if you have one. Just to keep things interesting, my trusty gelation assistant filmed (and yes, we realized after the fact that we had filmed it vertically - won't happen again) this hyperlapse of my jello slicing. And this little number. You love the jiggle. I am one of nine (!) Americans in my graduate program which is delightful for two reasons. One, I get exposed to many different perspectives in the classroom (a big reason why I chose the program I'm in). And two, we have an excuse to get together for our own Thanksgiving celebration. Now, no Thanksgiving is complete without Grandma Marjorie's Cranberry Salad so I went in search of the right ingredients and put this little number together for our feast (and yes, I brought a selection of jello molds to graduate school in another country). I love the global perspective my program offers but, I must admit, there's nothing quite like getting together with some fellow Americans to eat familiar food and talk about the questionable origins of many of our national holidays. It's safe to say that my first first year of graduate school was not all sunshine and butterflies. Not by a long shot. But there were some moments of genuine delight and many of them occurred thanks to one particular club on campus that I (thankfully) found early on. This was where I found people who saw the world just a little differently and who I felt like myself around. These people felt like home in a sea of fear and confusion and for that I am grateful. I believe so much in this home for the dreamers and change-makers that I decided to run for the executive board. I wanted so badly to help keep this place alive for other students to find a home in that I swallowed my nerves and submitted my nomination. The nerves came because I do not have a great track record when it comes to elected positions. In the 7th grade I ran for Treasurer of my middle school and the night before my big speech, my cat (who at the time I readily identified as my best friend) was hit by a car and died. I was devastated. But I got up on stage with my speech crumpled in my sweaty little hand and did my best. I didn't win. I found out later that someone circulated a rumor that my cat hadn't really died and I just told people that for pity votes. Middle school girls can be cruel. For those who know me in real life (and not just the internet) it might alarm you to hear that as a little kid I was actually painfully shy (I know). But somewhere towards the end of middle school, I found my voice. This didn't mean that I always knew how or when to use it (although, as usual, there's some gendered stuff in here that I'll unpack another day). I think I hit peak "opinionated" at some point in college and I've been mellowing out ever since. For many years I was just a bit of an acquired taste. I was often appointed to positions by teachers (especially if some kind of social justice was involved - law & order wasn't just a great TV show but a rule to live by) but rarely elected by popular vote. Now that I'm an adult (!) I have enough self-awareness (on most days) to listen more and talk less, something I have been practicing diligently at graduate school (and am successful at, on most days). The good news is that this particular election went my way and I had my very own Sally Field moment and now the real work begins. But before it did we had a lovely brunch with the outgoing and incoming club executives and obviously the occasion called for a jello mold. I took what I already had in my apartment - a box of raspberry Jell-O, fresh strawberries, and a bottle of lime Perrier - to make something fizzy and easy and required just the right amount of effort for a grad student. I used only half the total water prescribed and replaced the cold water with the Perrier, stirring in the sliced strawberries once it had gelled a bit in the fridge. Et voilà! An attractive and fitting addition to any brunch. Another beautiful weekend in the Golden State! We've been exploring and barbecuing with friends which is pretty much perfect. Yesterday (while reading in the shade by a lake) I decided that for dessert tonight, I would make something new. A nice perk of living in such a warm climate is that the produce is super fresh, plentiful, and relatively inexpensive. I had seen mangos at the grocery store in our neighborhood and thought now would be the time to try a mango jelly of some kind. After some Googling, this one seemed the freshest (just one cup of cream and a little lime juice to cut the richness). Our kitchen isn't terribly well-equipped but fortunately, Paige and her husband are generous with their housewares and time. So Paige was my right hand for this one and, as usual, a lovely photographer. She would want me to apologize for the poor lighting and off-coloring of the photos but I won't because they're so much better than my iPhone could have done. The first step is to find nice ripe mangos (although frozen works too) - mine were a bargain price of 5 for $5! Then you'll want to decide what to serve the pudding in. Ramekins work, but I also used a few jam jars because I thought it would look nice. Also, Paige has an unusually vast jam jar collection from her wedding five years ago. So pick what you'd like and arrange them on a baking sheet or something easy to transport them into the fridge on. Next, heat 3/4 cup of the water and 1/2 cup of the sugar in a small saucepan on high. Stir until the sugar is dissolved and the mixture is boiling, about 3 minutes. Remove from heat. Put your mango chunks in a blender, pour in hot sugar mixture, and blend on medium-high until very smooth, about 1 minute. Then pour through a fine mesh strainer set over a medium bowl and, using a rubber spatula, work the mixture through the strainer, discarding any pulp or stringy fibers (don't skip this step!). Measure 2 cups of the purée (reserve any extra purée for another use - a garnish? to stir into plain yogurt? go crazy); set aside. Again heat 1 1/4 cups of the remaining water in a small saucepan over high heat and bring to a boil. While you're doing that, place the remaining 3/4 cup sugar, gelatin, and salt in a large mixing bowl, add remaining 1/2 cup water, and whisk to incorporate, about 30 seconds. Add the boiling water and whisk until gelatin and sugar are dissolved, about 1 minute. Finally, whisk in the lime juice, 2 cups of mango purée, and cream (in that order to prevent curdling) until evenly combined. Pour this mixture into your receptacle of choice (I used a ladle) and refrigerate until set, at least 2 hours but that can vary wildly so I would recommend making the morning of or evening before. To garnish, I added a spoonful of the mango purée and some crumbles of toasted coconut chips. Next time I'll add a spoonful (or three) of whipped cream and extra coconut. So good. Perhaps the most delightful byproduct of a blog about gelatin is when people tell you they made a recipe you posted. It's happened a few times and I get a kick out of it whenever someone tells me about it. Sometimes they're seasoned cooks who feel comfortable in the kitchen (and with following directions - jello is chemistry after all) and sometimes they're...less so. Amateurs, if you will. But as fickle as jello can be, certain recipes are a lot more forgiving than you might imagine. A few months ago my partner told me he was going to make the infamous jello pretzel salad for a competition with a few friends at school (he's also in graduate school, but we're not in the same program because we like to do things the hard way). There's a group of about six friends who get together every month or so for dinner at someone's house and they call it "Come Dine With Me" after a UK television show, apparently. So each dinner they choose a dish for two challengers to prepare for the next dinner and he chose jello as the theme. When he first told me this I was delighted and then a little leery that he could pull it off without my help. I should point out that my partner is not a total moron and is quite a good cook but a jello amateur is a jello amateur. But he picked the recipe and we talked through it on the phone and off he went to the grocery store. He's British, so we had several conversations about what exactly Cool-Whip is and where to find the cream cheese but he made it home with the proper ingredients and got to work. There were a few check-in phone calls (particularly pertaining to the "done-ness" of the jello) but the final product looked pretty good (at least in person, next time we'll work on the food photography). The competition ended in a draw (which I still find hard to believe, jello pretzel salad is a blue ribbon choice) but I was super impressed. Always a good reminder to have a little more faith in your own and others' abilities when trying something new. I can't recall where I found this recipe but it's a perfect example of an old-school jello mold. I served it at one of my monthly dinner parties and was a nice addition to the other dishes. It's a small recipe which (hopefully) means no leftovers as this one is decidely less tasty the day after. I'd also like to take a minute here to remind you, dear readers, that jello is most often served as a side salad - not dessert. Any questions? Still the jello into the boiling water until dissolved. Refrigerate until it's slightly thickened (remember to check back frequently!). While the jello is in the fridge, mix the cream cheese (slightly softened) with the drained pineapple and nuts. When the jello is ready, fold this mixture in and then fold in the whipped cream last. Pour into your serving dish or jello mold and refrigerate overnight. I've mentioned her before, but my jello-blog idol has a great cookbook called "Hello, Jell-O!" which is chock-full of awesome recipes. They're tried and true recipes that she's put together after extensive experimentation so I've never been disappointed. I tried this recipe for one of my monthly dinner parties and made not only a larger mold for sharing but also a few individual molds to celebrate a few birthdays in the group. I usually eat my Nutella with a spoon straight from the jar but made an exception for this recipe (which calls for strawberries but I subbed in raspberries instead). Adapted from Victoria Belanger's Hello, Jell-O! Start with the first layer. Soak the gelatin in the cold water for a few minutes and then dissolve in the boiling water. Add the sugar and vanilla and stir until dissolved. Refrigerate until it's thickened up a bit (like a gel) while you arrange the fruit in the mold. Spoon in the gelatin and refrigerate until hardened but still sticky to the touch - keep an eye on it because it only takes a few minutes to go from too soft to too firm. And boy is it disappointing when THAT happens. While that's in the fridge, work on the second layer. Soak the gelatin in the cold water and again dissolve in the boiling water. Whisk in the Nutella and chill until it's thickened like a gel. Stir in the fruit and spoon onto the (still sticky) first layer in the mold. Refrigerate until quite firm (at least four hours but ideally overnight). Unmold and enjoy. Layering jello is tricky and even those of us (an admittedly small group) who make jello frequently still manage to fudge it up occasionally. The most important thing is to frequently check the layers - once they've crossed the line to too firm there's really no going back. And if one layer is too firm then it won't bond with the next layer and you'll end up with a hot mess when you try to unmold it. If you're a Nutella fan, you'll love this recipe. Trust me. I'm a modern, working woman and sometimes I just don't have a flexible enough work schedule to allow for me to come home every night and slave away over my jello molds to come up with new jello recipes for you fine folks. So sometimes, I take a shortcut and go with the simplest recipe I can find. Last week's Friday Dinner was one such occasion. I had already made a non-gelatin-related dessert the evening before - a coconut bar recipe from Gourmet Magazine (may it rest it in peace) that I've been meaning to try for forever - but needed something to go with it. I decided to go with a simple panna cotta because the weather had just recently turned and it finally felt like fall (and we all know that fall calls for heavy cream). I portioned out small, single servings in ramekins and topped them with a bite of coconut bar. The creamy panna cotta went really well with the crunchy and chewy coconut bars but in all honesty, the bars stole the show - let's just say I had NO leftovers. So because they were SO good, I've included both the simple panna cotta recipe and the coconut bar recipe for your enjoyment below. This is super easy, ready? Let the gelatin soak in the water while you heat the heavy cream, sugar, and vanilla in a saucepan until almost boiling. Then, remove the cream from the heat and stir in the gelatin until fully dissolved. Pour into your serving dishes and refrigerate until firm (at least a few hours or overnight). 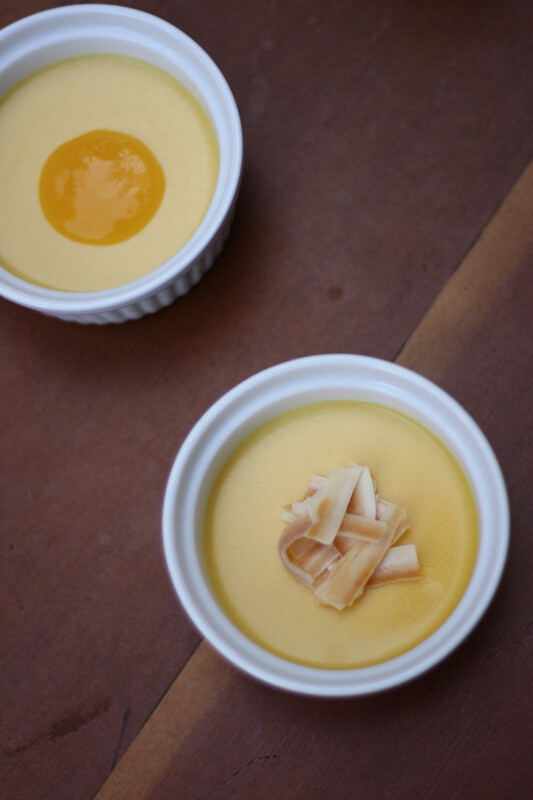 You can then unmold before serving or just buy cute dishes and serve the panna cotta in them. Done! Cream 1/2 cup of butter. Add gradually 1/2 cup brown sugar and beat until smooth. Stir in 1 cup sifted flour and spread batter in the bottom of a 8 inch square cake pan. Bake in a moderate oven (375) for 20 minutes. Beat 2 eggs and 1 cup light brown sugar until smooth. Stir in 1 teaspoon vanilla, 1 cup chopped walnuts, and 1/2 cup shredded coconut tossed with 2 tablespoons of flour and a pinch of salt. Spread this batter over the baked crust and continue to bake for 20 minutes longer. Cool, sprinkle with powdered sugar and cut into squares or bars. Bonjour! Did you miss me? Of course you did. Let's get down to business shall we? Since we last spoke I actually won my first ever jello-related contest and was rewarded with a sweet prize. Pretty amazing, right? Let me start at the beginning. You may or may not be aware of The Jello Mold Mistress of Brooklyn (Victoria Ballanger) but she's basically the Queen of Gelatin on the interwebs and also who I want to be when I grow up. She is not only super awesome (evidence of this here - I have no words) and creative but also an amazing photographer. Her jello creations look WAY better than mine and every time I go to her site I seriously consider investing in an actual camera (for when Paige isn't around of course). She recently published a JELLO BOOK (I. Know.) and partnered with The Recipe Club to host a jello photo contest to promote it. I, of course, submitted The Most Beautiful Jello Mold I Have Ever Made and miraculously (OK. There were only like, 10 submissions) I won a copy of the book. She even signed it "Stay Jiggly!" which is pretty fabulous. So all of this is to say that although I love making up my own jello recipes, sometimes it's really nice to let someone else do the experimenting for you. Last month I hosted another one of my Friday Dinners (the one year anniversary!) and since it's now The Most Wonderful Time of the Year (otherwise known as Fall) I was drawn to Victoria's Orange Spice recipe. So yes, if you want really beautiful jello pictures she's your gal. But where else will you get my quirky commentary alongside your gelatin recipes? No where else. Only here. I was a big fan of this recipe and I know those who tried it (some people just don't like jello - go figure) enjoyed it as well. So, if you're looking to spice up your fall jello routine, this is the recipe for you. Also, it's important that you listen to this song while preparing it. Trust me. In a saucepan, stir together peach syrup, vinegar, sugar, cloves, and cinnamon, and bring to a boil. Add peaches and simmer for 5 minutes. Carefully remove the cloves (this may take a minute!). Meanwhile, in a bowl, stir boiling water into gelatin until fully dissolved. Slowly stir in the peach mixture and the rum. Allow to cool to room temperature and pour into 6 cup mold (or bowl, or pan) and refrigerate until firm (ideally overnight). It's officially jello-molding season so I promise to be back soon with more of what you love. I know, you just can't get enough. I hope everyone had a lovely Easter and/or Passover! I'm not sure my Easter weekend could have been any more delightful and a highlight was definitely attending my friend Natasha's amazing brunch on Sunday. She is a dedicated Breaking the Mold blog reader (and commenter) and when she asked me to bring a jello mold for her brunch, I knew I had to step up my game. She also helped me brainstorm what to make and thanks to her inspiration (and color palette suggestions) the result did not disappoint. Natasha is fancy and has lived in France where a popular drink is champagne and sweet vermouth. I happened to have a bottle of super nice sweet red vermouth thanks to my friend Tyson (ahem, who doesn't read my blog, ahem) and a bottle of super low-end Cook's that I was reserving for my next boozey jello mold. When making champagne jello molds, the cheap stuff is actually best because the flavor comes through better and really, just save the good stuff for something else. Natasha is also an interior designer and has a great eye for color and design. As we were discussing what fruit to put in the mold, she suggested a monochromatic approach that would go well with the other dishes she was planning to serve at the brunch. Yes folks, we sometimes color coordinate our party food. Martha Stewart would be proud. The mold turned out beautifully and tasted pretty amazing. Some of the brunch guests had never had my jello before and were a little hesitant to give it a go. They didn't seem too traumatized after tasting it though...so, that's a win. Breaking the Mold blog: converting innocent people to jello-lovers (or jello-tolerators) since 2010. Start by soaking the gelatin in the 5 tablespoons of water. Then, dissolve the sugar in the 1/2 cup of water over low heat. 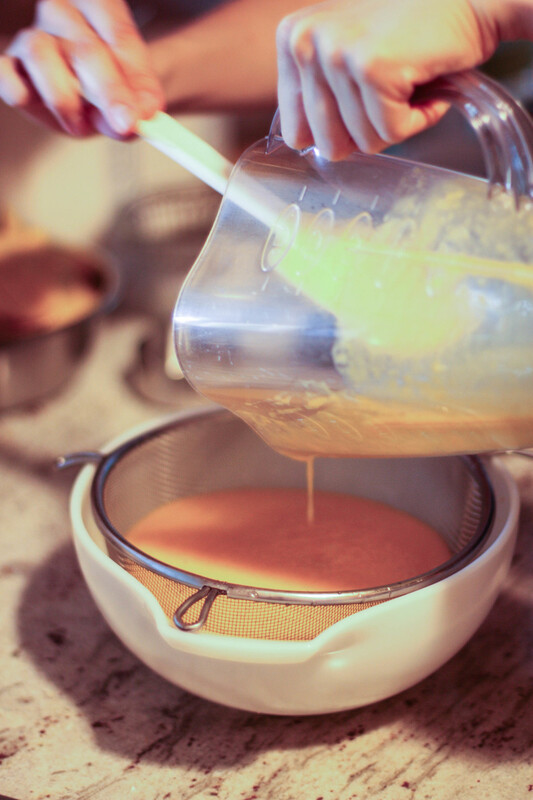 Once dissolved, add the two cups of champagne and then whisk in the gelatin until it's also completely dissolved. Add 1 drop of red food coloring and reserve 3/4 cup of the mixture before putting the rest in the fridge until the mixture thickens into a gel (approx. 60-90 minutes depending on...a lot of things - just check back often!). Whisk 1/4 cup of sweet red vermouth into the reserved 3/4 cup of the gelatin mixture and leave out at room temperature. Once the gelatin mixture in the fridge has thickened into a gel, stir in the fruit and spoon into your mold. Return to the fridge to firm up (maybe another 30 minutes?) but check back frequently. You'll want to pour the final layer when the jello is firm but sticks to your finger when you touch it. Once it's reached that point, you can add a bit more fruit to the vermouth/gelatin mixture and spoon gently into the mold. Return to the fridge for at least another few hours to firm up. Finally, unmold on a pretty plate and impress all your friends. Paige did a mini-photo shoot of every fabulous thing at this brunch so I've included a few more photos for your viewing pleasure.